With the royal wedding less than two weeks away, I thought it was high time we revisited our trip to Windsor Castle. Windsor Castle is of course, the site of Prince Harry and Meghan Markle’s upcoming wedding on May 19, 2018. The ceremony will take place at St. George’s Chapel within the castle grounds. 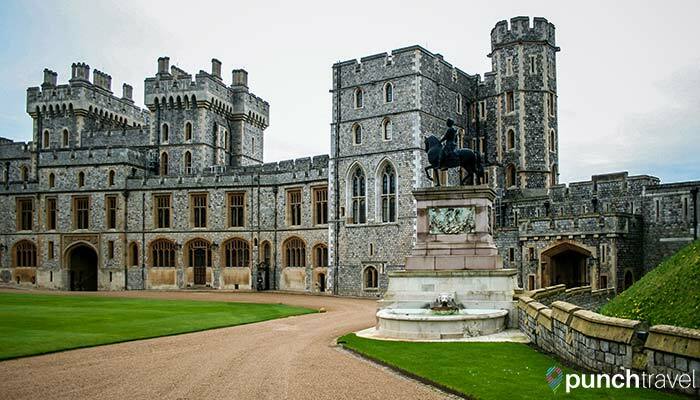 Windsor Castle is the weekend home of Her Majesty the Queen, Elizabeth II. From Thursday afternoon through Monday afternoon, she lives here in this stunning castle. The rest of the week she resides at Buckingham Palace in London. 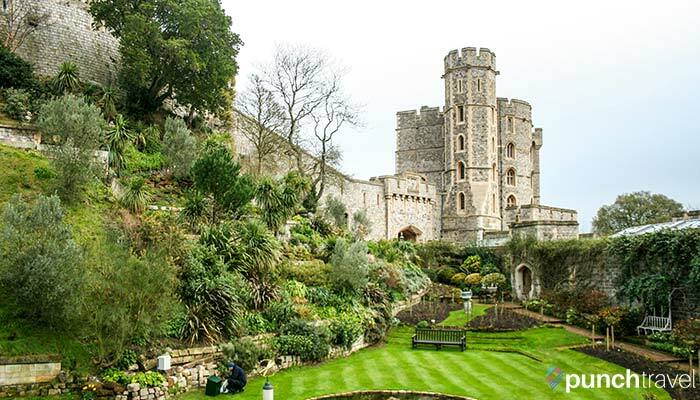 Located about an hour by train from London, Windsor Castle is easily accessible and serviced by Southwest Trains. There are two stations in the city stops in Windsor: Eton and Riverside, and Eton and Central, both within walking distance to the castle. Trains leave London frequently throughout the day and service both stations. Train tickets can be purchased in advance or on the day of travel. For the lowest price, purchase the Super Off Peak ticket. The ticket is valid for travel as long as you return to London after 12pm on weekdays or anytime on weekends and holidays. Click here for more information on different train ticket options. The town of Windsor is small, quaint and rich in history not only from its most famous inhabitant. Across from the castle is a small cobbled street with some famous former residents. Nell Gwynn, the actress and mistress of King Charles II resided here. 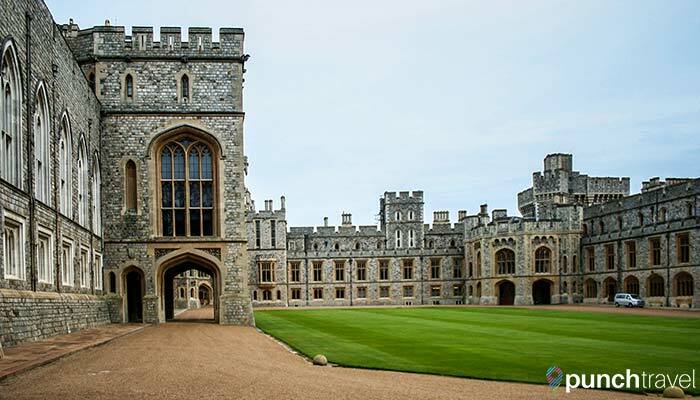 Rumor has it, the king visited her via a secret passage built underground between Windsor Castle and her home. Not far from the castle are plenty of stores and boutiques in the Windsor Royal Shopping mall, located inside an old train station. Here you’ll find stores like Waitrose, H&M, Topshop and Zara. Windsor Castle is open year-round. From March to October, Windsor Castle is open from 9:30am to 5:30pm and from November to February it is open from 9:45am to 4:15pm. As a working royal palace, the castle is frequently used by The Queen for state ceremonies and official entertaining, and closures can occasionally occur at short notice. 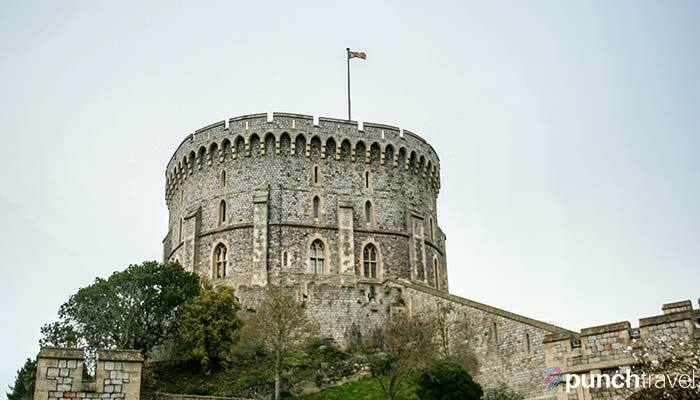 Before you visit, check the Windsor Castle website for the latest closures and updates. The Semi-State Rooms are only open during the winter months and the Semi-State Rooms are not open when the State Apartments are closed. Regular adult ticket prices are £21.20 each, with concessions available for children, seniors and students. When the state apartments are closed, the adult ticket price is reduced to £11.70. 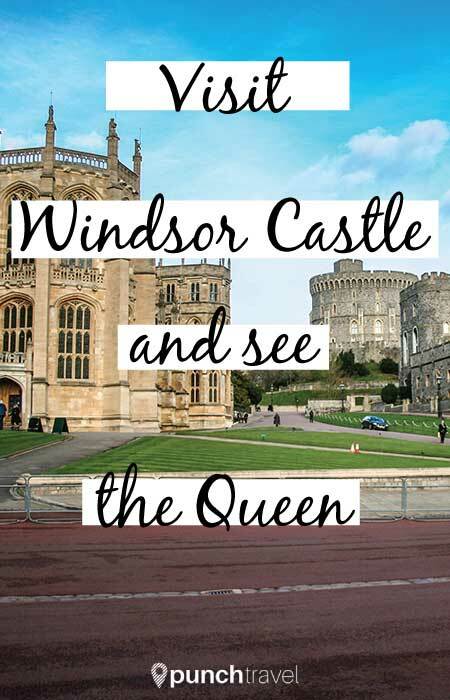 A small discount is available when purchasing your Windsor Castle ticket in conjunction with your train ticket and occasionally you can find discounts through sites like 365 tickets. After you buy your ticket, you must pass through a quick security screening before you begin your visit. Once through, stop by the visitor center to pick up a complimentary audio guide which walks you through each of the four main buildings that you will see during your visit. The tour is available in multiple languages, and there is also a children’s version. Guided tours depart every hour from outside the audio guide pick-up station. If you can, I recommend joining a tour to get the gossip and insider info that you won’t get from just reading the signs inside the buildings. The tour takes you around various points on the grounds and ends at the entrance to the State Apartments. Queen Mary’s Dolls House: This impressive dollhouse was a gift to Queen Mary, wife of King George V. However don’t be fooled, this is not just a toy. The house was designed to showcase the finest modern goods of the 20th century, including miniature furnishings, lighting and paintings and novels from popular writers of the time like J.M. Barrie and Sir Arthur Conan Doyle. The house is fully functional, fit with flushable toilets and working light fixtures. The State Apartments: Today the State Apartments are often used by members of the Royal Family for special events and ceremonies but historically these rooms were used for everything from receiving foreign figures to knighting ceremonies. The rooms are decorated with works of art from Rembrandt, Rubens and more. Don’t miss St. George’s Hall, the Grand Staircase and the Waterloo Chamber. 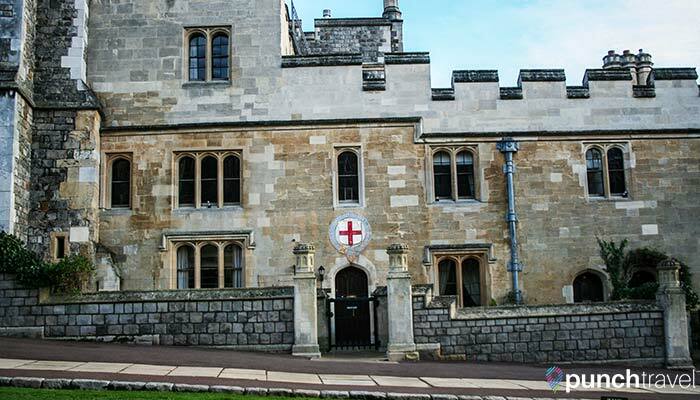 The Semi-State Rooms: The best time to visit Windsor Castle is during the winter, when the Semi-State Rooms are open. The Queen uses these rooms for official entertaining. Much of the Semi-State Rooms and the State Apartments were damaged in a fire in 1992, but today they have been restored to their 19th century appearance. 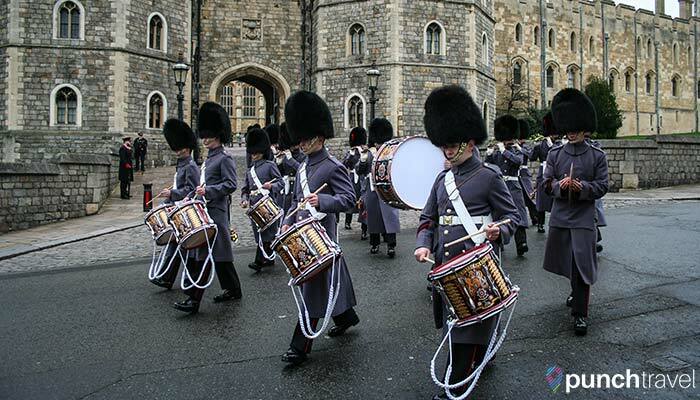 Changing of the Guard: Every morning at 11:00am, the changing of the guard takes place in front of the barracks. The ceremony lasts about 20 minutes and ends with the old guard exiting through the portcullis and onto the street outside the castle. 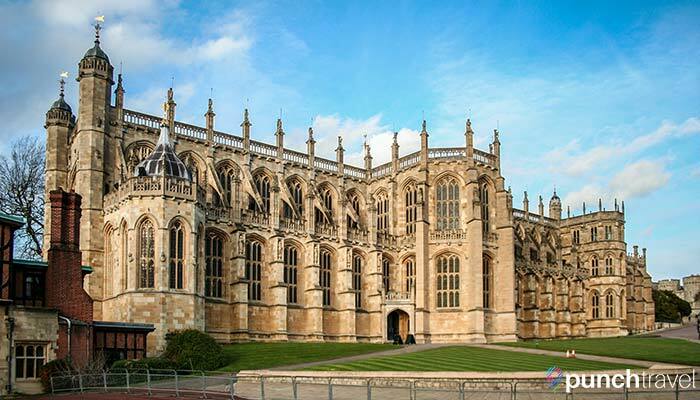 St. George’s Chapel: This modest chapel is located within the walls of Windsor Castle, but services are open to the public. Like many of England’s religious monuments, the chapel is famous because of those who are interred here. Notable persons include King Henry VIII, Charles I and Queen Elizabeth and George VI, the parents of the current Queen Mother. St. George’s Chapel is also significant as it is home to the Order of the Garter, the highest order of chivalry (aka knights) in England and the United Kingdom. The garter stall plates are displayed in the chapel, alongside the crests and banners of each knight in the order. Notice the flag at the top of the tower? Called the Royal Standard of the United Kingdom, this flag bears the shield of the Royal Arms and when flown, it means that the queen is in residence. If it is the Union Flag (the national flag of the United Kingdom), it means that she is not here. From St. George’s Hall in the State Apartment, keep your eye on driveway of the private apartments. Every Monday after lunch time, Her Majesty the Queen takes her Jaguar to head into London to Buckingham Palace. If you look carefully, you can see her exiting her private apartments and into the waiting car. You won’t find any food sold on the premises, so pack a lunch or pick one up at one of the many nearby cafes and restaurants outside the castle walls. There are benches throughout the grounds where you can sit and rest. Unfortunately photography is not allowed inside any of the buildings. You may only take photos from the grounds outside.